TheRustedChain - The Blog: Rise up and Give Love! Rise up and Give Love! If you've watched our business for very long, you know that we have a heart for giving. Sometimes it's overseas. Sometimes it's to help children with cancer. Sometimes it goes unmentioned, and just happens behind the scenes. Sometimes it's to help stop human trafficking. But now, it's right here at home. In our own country, on our own coastline. I don't do many things very well. But one of the few things I can do is make jewelry. Create new things. And it just makes sense to use my very limited gift, to try and share love to others. 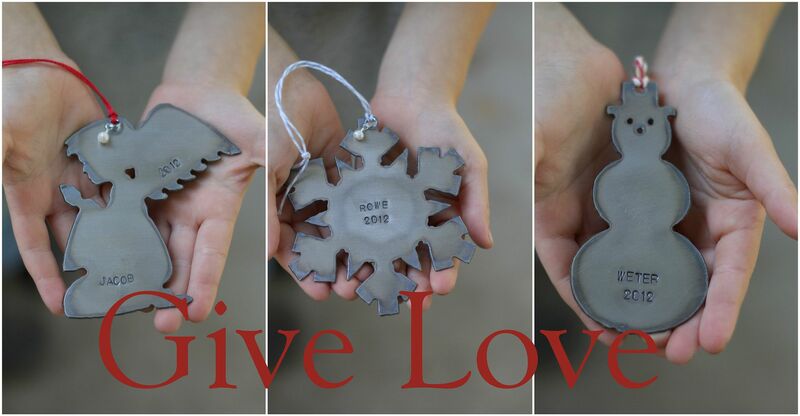 So for the entire month of November, $5 from every Christmas ornament sold will be given to WorldVision to help New York and New Jersey clean up from Sandy! Grab an ornament for you. For your family. For your kid's teacher. For your hair stylist. For your coffee barista. Every time you do, $5 goes to help people, our own American friends and family, who are in desperate need. If you can't give, will you consider sharing this? Share on twitter, facebook, pinterest, whatever you can. We want to give big! We want to give love! Whatever your hand finds to do, do it with all of your might.